Mary Kuper is presently exhibiting a series of prints and illustrations, inspired by the ever changing meanings of words, at the Free Word Centre in Clerkenwell. Our Christmas card this year has been designed by Mary Kuper. 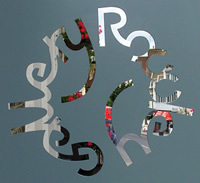 Each year we ask a different artist to transform our Rowley Gallery logo into a seasonal Yule Logo. A belated and animated happy new year from Mary Kuper. See more here.